several new features to help G Suite customers stay secure. Among those were new controls to help users safeguard highly sensitive content in Team Drives. These controls are now launching to all G Suite Business, Enterprise, Education, and Nonprofit domains. Admin controls will start rolling out to all domains today. End user controls are launching to rapid release domains in one week and scheduled release domains in three weeks. Initially the feature is only available for Google Drive on the web (drive.google.com). See below for more details. Downloaded, copied, or printed by commenters and viewers. *To modify these settings, users must (1) be in the same domain as the Team Drive and (2) have full access to the Team Drive. For more information on how to modify these settings, visit the Help Center. Prevent full-access members from modifying the Team Drive’s settings. Prevent users in your organization from creating new Team Drives. Prevent people outside of their domain from accessing files in the Team Drive. Prevent non-members from accessing files in the Team Drive. Prevent commenters and viewers from downloading, copying, and printing files in the Team Drive. 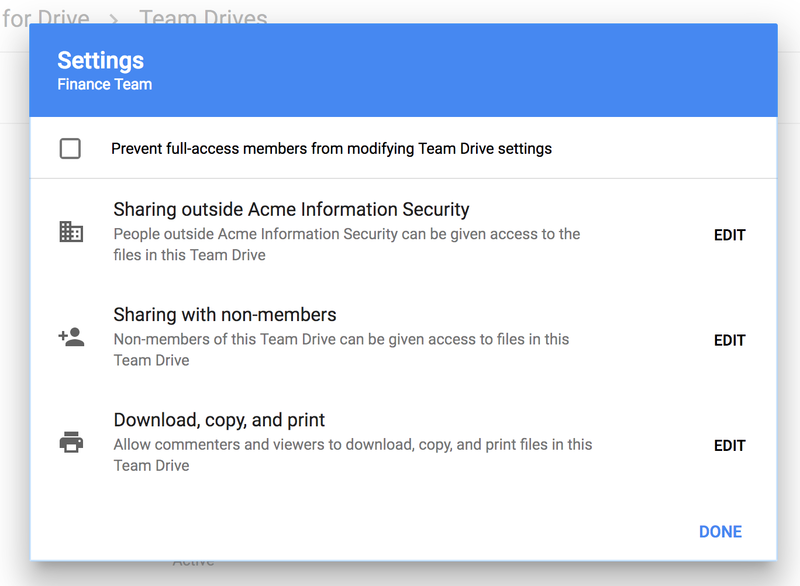 Note that unless Prevent full access members from modifying the Team Drive’s settings is checked, full access members are allowed to change a Team Drive's settings (from the defaults) after it's created. For more information on selecting these default settings in the Admin console, visit the Help Center. G Suite admins can modify the settings of any individual Team Drive in their domain. For instructions, visit the Help Center. If Team Drive protections are more restrictive than previously applied document-level protections, the Team Drive protections will take precedence. This means some users may lose access to documents when Team Drive settings are put in place. If a document with more restrictive protections is placed in a Team Drive with less restrictive protections, the document’s original protections will still apply to that document. Furthermore, document level restrictions will always stay in place unless specifically changed or removed from that document. A document will only have the protections applied to the Team Drive while it is in the Team Drive. If it’s moved to a different location, none of the Team Drive protections will move with it. However, any protections in place before it was in a Team Drive will still apply. See our help center for more details on how document and Team Drive protections apply in specific scenarios. To reduce unintended data leakage, we encourage G Suite admins to begin using these settings in their domains today. Initially the controls are only available for Google Drive on the web (drive.google.com). For more information on Team Drives, visit the Help Center and Learning Center. This March, we announced several new features to help G Suite customers stay secure. Among those were new controls to help users safeguard highly sensitive content in Team Drives. These controls are now launching to all G Suite Business, Enterprise, Education, and Nonprofit domains.